Whatcha Eatin'? : The Best Mac & Cheese I've Ever Had! •Next add one half cup margarine to coat noodles. •Bake for 45 minutes at 375 or so. 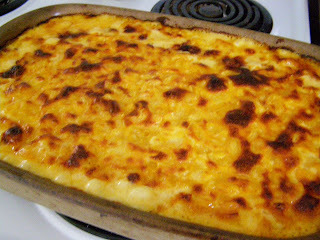 Yummmm... macaroni and cheese is just such terrific comfort food. Mac and cheese is certainly a true comfort food and reading the ingredients has me craving it! I have not had Mac and cheese for a long time and yours looks delicious! Ooh, I love a good mac and cheese! I am always looking for a good mac and cheese recipe! Thanks for sharing!